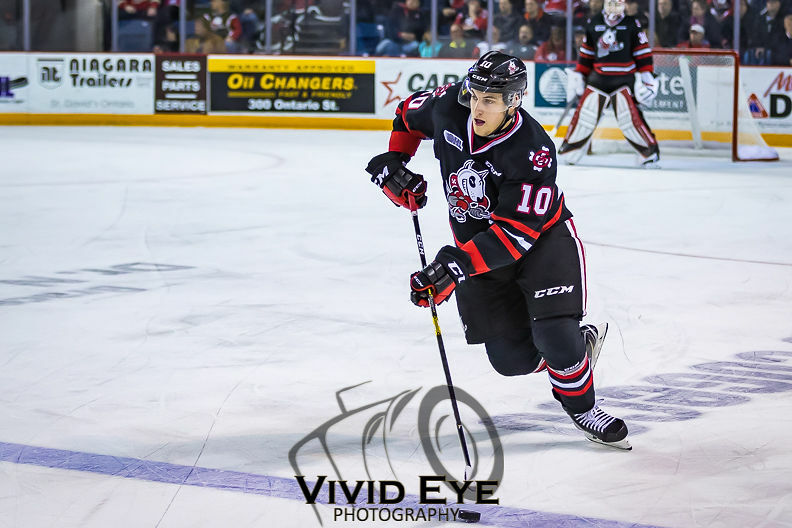 The Niagara IceDogs played against the Mississauga Steelheads for the first time this year at the Meridian Centre, with the score 3-1 for the Steelheads. The game remained scoreless in the first period. Less than five seconds into a five minute match penalty in the second period, Mississauga scored to make it 1-0. Mississauga scored twice throughout the rest of the middle frame, ending the period 3-0. The ‘Dogs got on the board thanks to a trio of players in the third! Matt Brassard skated around the top of the faceoff circle, passing to Jason Robertson at the dot in the other circle. As he went to his knee, he sent a shot towards the net which rebounded off the Steelheads’ netminder. Kirill Maksimov picked up the puck to score on the powerplay through the slot! The score remained 3-1 to the end of the game. In tonight’s match, Robertson extended his point streak to ten games. The ‘Dogs play away for a while, with three games against Sault Ste. Marie (Feb. 9), Sudbury Wolves (Feb. 10), and Erie Otters (Feb. 16). The next home game is on Sunday February the 17th! Dedicated towards mental health in youth, it’s presented by the Canadian Mental Health Association, Niagara Branch, and Teachers Life. There will be a post-game family skate by Tim Hortons, offering free hot chocolate! Helmets and skates must be checked at ice-level before the game. Children under 14 must wear a helmet.